Well working laser designs need to be based on a thorough theoretical understanding of laser physics and on various calculations. For example, resonator designs for bulk lasers should be checked and possibly optimized in terms of alignment sensitivity. 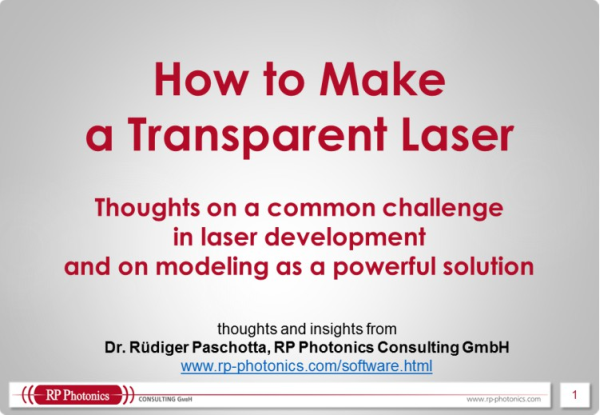 RP Photonics offers competent help in this area as well as powerful simulation software. The term design can have two different meanings. In some cases, it is meant to be a detailed description of a device, including e.g. used parts, how they are put together, and important operation parameters. In other cases, the term denotes the process leading to such a description. This article discusses some important aspects for the design of laser devices, such as diode-pumped solid-state lasers, or similar devices such as optical parametric oscillators. A separate article on laser development gives additional information. optimum performance, e.g. in terms of output power, power efficiency, beam quality, brightness, intensity and/or phase noise, long-term stability (e.g. of the output power or the optical frequency), timing jitter, etc. It is certainly advisable to work out carefully the list of these requirements for the particular case before investing any significant resources in laser development, because it can easily be much more expensive and time-consuming to introduce additional properties into an already existing device. selection of gain medium (e.g. a laser crystal) and pump source, suitable choice of geometry (e.g. rod or thin disk, side pumping or end pumping), doping concentration, crystal length, etc. selection and placement of laser mirrors and intracavity components for wavelength tuning, generation of short pulses via mode locking, dispersion compensation, frequency stabilization, etc. This list, which is certainly not yet complete, shows that proper laser designs are not a trivial matter, but are essential for achieving full customer satisfaction, cost efficiency, and flexibility for future developments. practical experience with lasers, enabling one to recognize typical problems, correctly interpret experimental observations, etc. It is clear that software alone is by no means sufficient to work out good laser designs. It is common practice, but nevertheless generally not advisable, to consider a laser design as a result of a development process which is largely based on trial and error. The design then plays a minor role, just summarizing the results of a lengthy process. In such cases, the design is often not even properly documented, which creates a risk of losing a lot of potentially valuable information while saving only a minor amount of time at the moment. The laser design is made in the office, not in the laboratory, and properly deals with all known issues which can be or become relevant. Although this process can be much faster and cheaper than a trial-and-error approach in the lab, it takes some considerable discipline and of course requires a comprehensive expertise. A proper design is not just a set of ideas, but a very specific description, including e.g. the list of required parts, a more or less detailed prescription on how to put them together wherever this is not trivial, and is ideally supplemented by a description of the underlying reasoning, a discussion of limitations, etc. The prototype is then fabricated according to the design, and not vice versa. This greatly speeds up the fabrication, thus making efficient use of costly laboratory resources. For any future development of similar kind, the carefully worked out design will be a very valuable input. If it does not exist, and particularly if in addition a vital person has left the company, future developments will be much less efficient. Attempts to abbreviate this process carry the risk of obtaining reduced performance values and of large time delays due to unexpected technical problems. The later such problems are recognized, understood and solved, the larger can be the resulting damage. In industrial development, it is common to derive some product design from an older design, rather than starting from scratch. Although this appears very economical, there are significant risks, particularly in cases where the first design has not be properly worked out and documented in a process as described above. A central challenge is that modifying some detail of a laser design may easily have unexpected side effects, introducing new problems which then require additional measures, which again can have side effects. For such reasons, starting with some initial design, which works e.g. with some lower than desired output power, can be helpful, but it still requires a detailed understanding of that design and its limitations. A proper design document for the initial design can make it easy to produce a whole family of designs, which differ in e.g. output power or pulse repetition rate. Under certain circumstances, it may be appropriate to make a review of an existing laser design. This can be the case, for example, when significant problems have occurred, or when the demands have increased and might be met with a revised design, rather than with a completely new one. If a properly documented design does not yet exist, it is high time to do this job; this process may already deliver important hints concerning what to improve.